A specific type of edge on a flower, where the edge is of a different color than that of the flower’s base color. 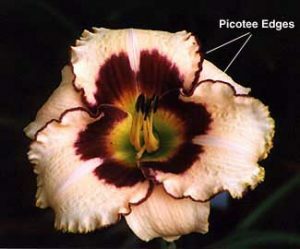 Picotees can have borders or margins which are lighter or darker, but they should be of a contrasting color, i.e., white edge on a red flower or red edge on an eyed flower. 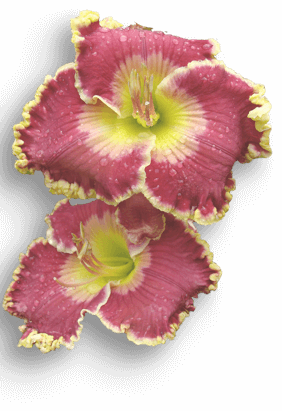 The only criterion is that the edge be of a contrasting color as the base of the flower; it can sometimes take bizarre shapes as well as hooks, horns, teeth, bubbles, braids, or fringe. All picotees are edges, but not all edges are picotees. All picotees are picoteed edges.